You are so friggin talented, it's scary. You knit as fast as you read. You're puttin' out more knitted critters than the cabbagepatch factory. Until I learned how cool these things could be, I didn't give a rip about knittin'. How about if you make every other knitted critter armless/legless. Or every 3rd? How much for you to knit me one on commission for karole's/mala's kids? SO cute! I want to knit Kate at some point, but I feel like I should make some headway on the sweater before I allow myself to cast on for something new. The problem with Jess Hutchinson's patterns is that they are almost TOO quick and satisfying to make -- you stop wanting to knit anything else! Your bears are so cute! I tried the Odd Fellow, and that's as far as I've gotten. I had to use bulky yarn because I can't find an LYS that stocks LWP - where did you find it?? I'm in Atlanta too. 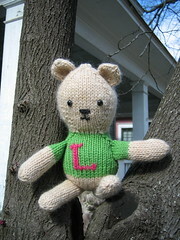 The Laurie bear is the perfect Laurie gift! She now sits on the corner of my crockpot and seems to be typing on my Speak & Spell hanging on the wall to her side. Can you tell that I've got an ecclectic funky-junky, artsy-fartsy style when it comes to decorating?